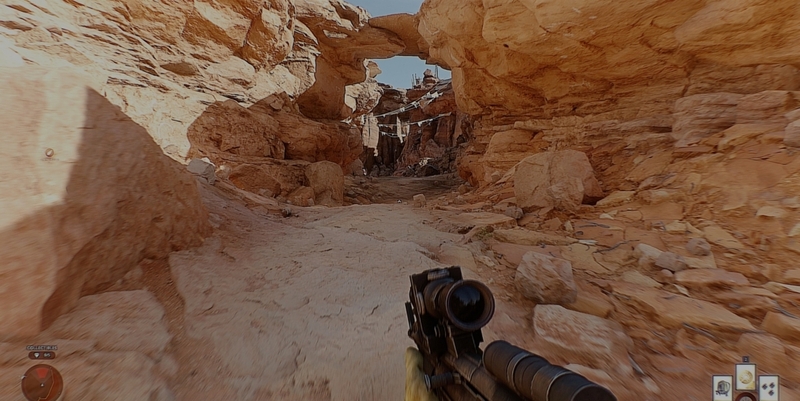 Star Wars Battlefront is already a gorgeous game, and it runs surprisingly well on a range of PC hardware. But if you're willing to sacrifice performance for the sake of visuals, modder Martin Bergman is working on a set of tweaks that might appeal to you. Bergman has taken his Toddyhancer mod, which made Grand Theft Auto V look awesome a couple of months ago, and applied it to Battlefront. The mod essentially combines a series of intensive shaders, filters, bloom effects and more to make the game look more realistic, and the results are pretty amazing. With Toddyhancer applied, Battlefront is transformed from a beautiful game into something that looks just like an actual Star Wars movie. It does come at a significant performance cost, though, with Bergman revealing in his gallery of screenshots that the mod drops his frame rate by around 30 to 40 FPS. So far the mod has only been applied to the game's Tatooine map, and it appears to be specifically tweaked to beautify the planet's rocky landscape. The mod also hasn't been released as yet, so for now we only have these impressive screenshots and the hope that one day the mod will be available to try out.